Take exit 5 and make a right onto Route 541. At the Lumberton South sign, make a right onto the Route 541 By-pass. Cross over Route 38. At the second traffic light, make a right onto Route 541. Go through Lumberton to Fostertown Road (Route 612). Make a right onto route 612. Take the first left (Stacy Haines Road). The Museum is 2 miles on the right hand side, at the South Jersey Regional Airport. Take the Mount Holly exit to Route 541 South. Make a right at the Lumberton South sign (Route 541 By-pass). Cross over Route 38. At the second traffic light, make a right onto Route 541. Go through Lumberton to Fostertown Road (Route 612). Make a right onto route 612. Take the first left (Stacy Haines Road). The Museum is 2 miles on the right hand side, at the South Jersey Regional Airport. Turn onto Ark Road. Follow Ark Road 2.2 miles to the four-way stop. Make a left onto Stacy Haines Road. The Museum is 1 mile on the left hand side, at the South Jersey Regional Airport. 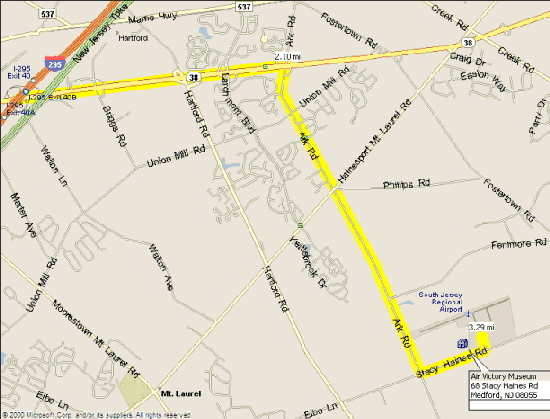 Follow Route 541 North and make a left onto Fostertown Road (Route 612). Make the first left onto Stacy Haines Road. The Museum is 2 Miles on the right hand side, at the South Jersey Regional Airport.